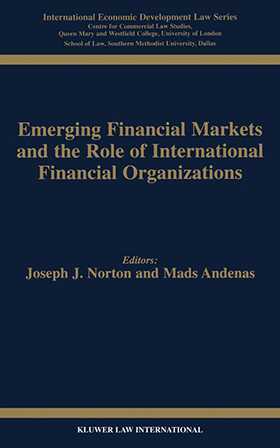 This book brings together the papers presented at a conference on `Emerging Financial Markets and the Role of International Organisations' which was held in May 1995 and organised under the auspices of the Offices of the European Bank for Reconstruction and Development, SMU School of Law Dallas, QMW College, Centre for Commercial Law Studies and King's College London. The papers are written by leading experts and cover a broad range of topics, including general policy and institutional issues, securities and banking markets. The editors have provided an invaluable service in bringing together for a wider audience this significant collection of thought-provoking papers.